This is the term that refers to the optional, two years, final stage of secondary education undertaken by 16-18 year old students studying in maintained schools and colleges in England and Wales. If opting for the academically challenging, subject based A’Levels, students usually choose 3 or more and for those considering university, they tend to choose subjects they’re interested in doing for their degree. However, A’Levels can also be used as an entree into work placed training or the world of employment. Alternatively there is the option to choose the more practical and vocational BTECs (Business, Technology and Education Council). BTECS like A’Levels are subject specific and at Level 3 can be used as entry qualifications to most UK (but not all) universities. They can also be used to access training and employment. Some students take a combination of A’Levels and BTECs. How are A’Levels and BTECs Graded? 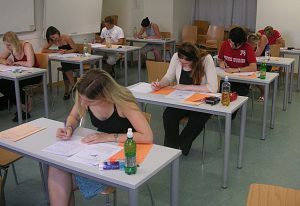 A’Level grades are awarded based on the outcome of exams taken at the end of the second academic year. The highest grade achievable is an A* and the lowest pass is an E.
Level 3 BTECs, also known as BTEC Nationals, are assessed via written and practical units of course work and are graded Pass, Merit, Distinction or highest of all a Distinction *. The ‘U’ (unclassified) grade applies to A’Levels and BTECs where the minimum standard of respectively ‘E’ or ‘Pass’ has not been reached. If you found this blog useful you might like to read our blogs about Key Stage 1, Key Stage 2, Key Stage 3 and Key Stage 4. We have Key Stage 5 teaching jobs all over England and Wales that you can browse here. If you’re a UK based teacher or teaching assistant you can pre-register with us here, and if you’re based overseas, you make initial contact with us here.